Percutaneous radiofrequency ablation can be performed under intravenous sedation and local anesthesia or general anesthesia. 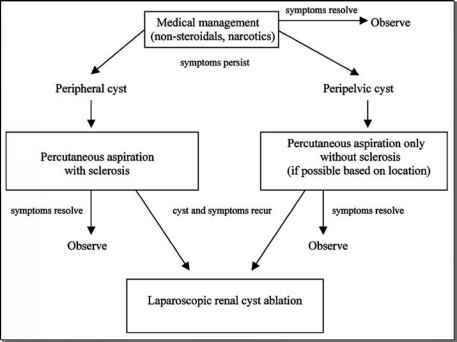 We prefer general anesthesia, as kidney location can be contrasted and is reproducible expediting the procedure. After induction of anesthesia, a parenteral intravenous antibiotic is administered, an orogastric tube placed and a urethral catheter inserted. The patient is then placed prone or in a flank position on the computed tomography gantry with arms secured to ensure clearance through the scanner. With the assistance of an interventional radiologist, intravenous contrast is first administered to accurately image the lesion. If iodinated contrast is contraindicated, a small dose or gadolinium can be administered. Alternative, ultrasound guidance may be employed. However, we discourage its routine use due to the technology's inherent resolution variability. First, a 20-gauge Chiba needle is usually directed to the peripheral rim of the renal tumor as a "finder needle." Placement is confirmed with repeat computed tomography imaging. An 18-gauge core biopsy needle is passed adjacent to the Chiba needle into the peripheral margin of the tumor. Following computed tomography confirmation of positioning, multiple tissue cores are obtained. A radiofrequency interstitial tumor ablation Starburst XL probe is then placed along side the Chiba needle to the same depth. When repeat computed tomography imaging demonstrates adequate positioning of the radiofrequency probe, the tip is advanced to just within the peripheral tumor margin and the Chiba needle is withdrawn. We prefer the "finder needle" technique to minimize the number of radiofrequency probe positioning attempts and thereby the risk of peri-lesion breeding and, "theoretical," tumor cell spillage. Similar to the laparoscopic technique, the tines of the radiofrequency probe are then deployed for an ablation diameter approximately 0.5 to 1.0 cm beyond the computed tomography-measured tumor diameter. Prior to ablation, successful deployment of the radiofrequency tines is confirmed by repeat computed tomography imaging which should demonstrate coverage of the entire tumor as well as a rim of normal parenchyma at the deep tumor margin (Fig. 2). Radiofrequency ablation is performed utilizing the same protocol as described for the laparoscopic radiofrequency ablation. If adequate tumor coverage is not accomplished because of tumor size or shape, the radiofrequency probe is reposi-tioned in a different portion of the tumor for a second round of treatment. Following the ablation, the probe is withdrawn slowly through Gerota's fat in "track ablate" mode to prevent bleeding and the "theoretical" risk of tumor seeding. In this mode, the probe track is heated to 75°C or greater. Immediate postablation contrast computed tomography imaging is repeated to assess whether the mass has been successfully ablated (Table 3). 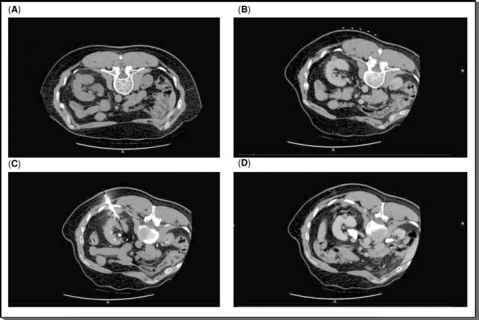 FIGURE2 ■ (A) A small left posterior renal tumor is seen in the noncontrast phase while the patient is prone. (B) Contrast has been given and the patient is slightly rotated to optimize probe angle. (C) The tumor has been targeted and the tines are deployed beyond the tumor margin. (D) The postablation defect. Note the lack of contrast uptake by the lesion.